A reside nt of Gorakhpur, Uttar Pradesh Anil Sahni is blind by birth. Two of his siblings, an elder sister and a younger brother are also visually impaired. He belongs to an economically weak family with his father as the sole bread earner. Anil’s mother is uneducated herself but she has aspirations for all her four children. She dreams of seeing them grow up into well-educated and respectfully employed individuals. Anil like all other children his age started his education in a regular school. And since no one in his family knew about special schools for the blind, Anil had to rely on his hearing for all that was being taught in the mainstream classroom. He was keen to learn but his learning was limited by his visual impairment. 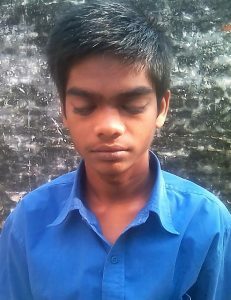 It was only when he turned 16 that Anil enrolled in a blind school for his Class 10. When Anil’s friends at his new school told him about Eyeway, he was curious to know more. He called our Helpdesk and inquired for his mobility and study needs. He also asked if there were any provisions made by the government for blind people like him. Eyeway counselor told Anil about assistive devices like Daisy player for reading and the smart cane for walking independently. The counselor also shared details about courses available at the National Institute for the Visually Handicapped (NIVH), Dehradun. Anil was encouraged to get in touch with NIVH so he could get proper computer training and any other vocational training which would open up job avenues for him once he completes his studies. We also helped him apply for a UDID card which would enable him to apply for various government provisions and concessions in the future. Anil is in regular touch with Eyeway and he calls frequently whenever he hits a stumbling block. And not just Anil, his other two visually impaired siblings are also benefitting from the information shared by us.